30. The definite decision for the Meuse-Argonne phase of the great allied convergent attack was agreed to in my conference with Marshal Foch and Gen. Petain on September 2. It was planned to use all available forces of the First Army, including such divisions and troops as we might be able to withdraw from the St. Mihiel front. 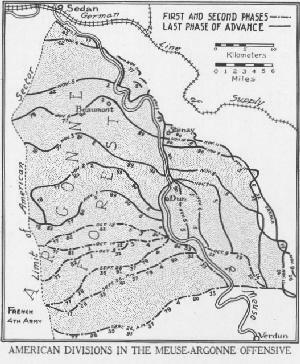 The Army was to break through the enemy’s successive fortified zones to include the Kriemhilde-Stellung, or Hindenburg Line, on the front Brieulles-Romagne sous Montfaucon-Grandpre, and thereafter, by developing pressure toward Mezieres, was to insure the fall of the Hindenburg Line along the Aisne River in front of the Fourth French Army, which was to attack to the west of the Argonne Forest. A penetration of some 12 to 15 kilometers was required to reach the Hindenburg Line on our front, and the enemy’s defenses were virtually continuous throughout that depth. 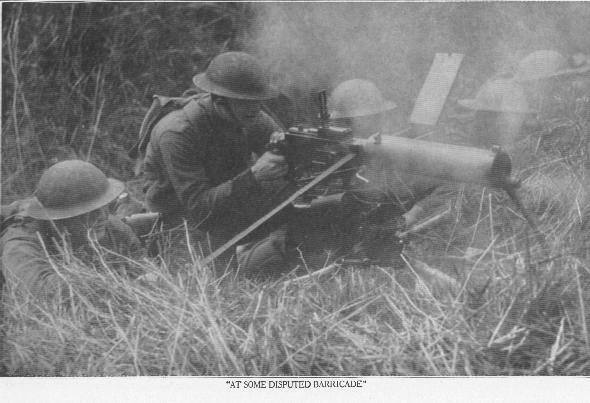 The Meuse-Argonne front had been practically stabilized in September, 1914, and, except for minor fluctuations during the German attacks on Verdun in 1916 and the French counteroffensive in August, 1917, remained unchanged until the American advance in 1918. The net result of the four years’ struggle on this ground was a German defensive system of unusual depth and strength and a wide zone of utter devastation, itself a serious obstacle to offensive operations.